These darn wobbly teeth have been wobbling for months now and still no definitive movement! Pinkster is getting so frustrated, waiting for another coin and more importantly, a letter from the tooth fairy. 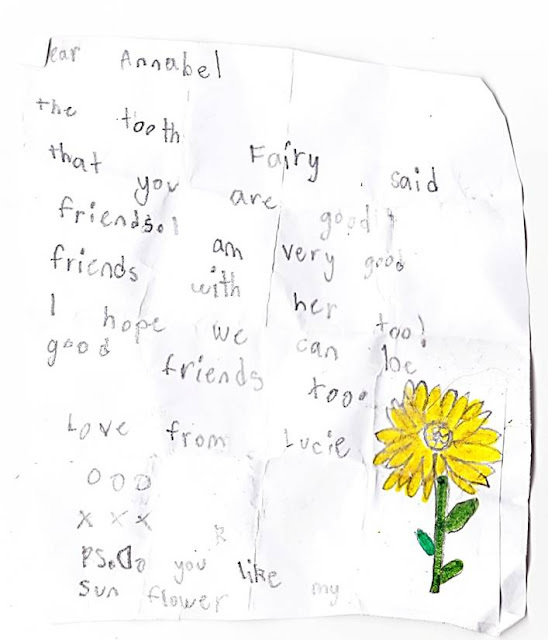 During the first spate of lost teeth - sometimes two in a week, there was a lot of correspondence, drawings and pressed flowers exchanging hands. So missing all that tooth fairy social interaction Pinkster has taken to leaving notes in the garden addressed the tooth fairy. And to the tooth fairy's friends for that matter. It often takes a while to get a response, since the fairies have to be flying over our place and notice the notes, in the dark, while avoiding the cats and the possums. I’m sorry it has taken me so long to write back to you, I’ve been having a holiday and visiting my family in the Magical North. 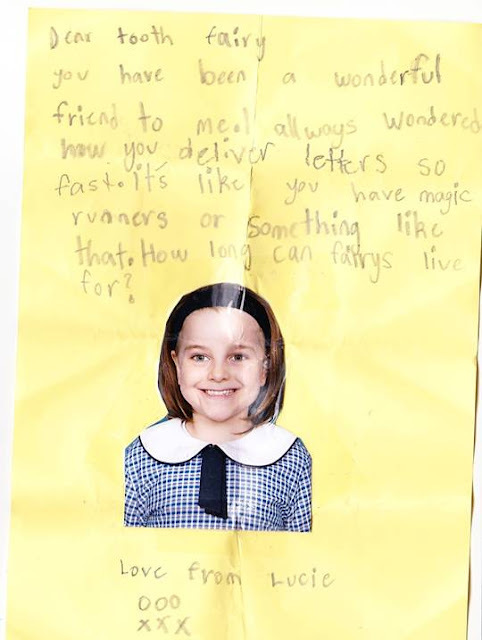 Alice is indeed my very good friend, she’s very sweet, and it was Alice who has been saving your letter for me since she found it in your garden. She was flying past on the way to collect another little child’s tooth in the same area. I love, love LOVE the pretty sun flower you drew for me and I think I might hang it up on my wall! Alice loves it too. I would love to be good friends with you too. Maybe if I’m not busy next time you lose a tooth, I can come with Alice to collect it. She did say that you seemed to have some more loose ones so that might not be long away. By the way, do you like my typing? YES! I’m typing not writing! ! Alice is good at typing but she likes to write everything by hand with that magic pen of hers - when she has time that is.. I don’t like the pens because they’re still quite big for our hands and I have so much to say I get achy hands by the time I’ve finished! Can you type? I think it’s kind of hard when you first start trying. Anyway I’d better go for now. PS I found a big yellow letter for Alice, it just said Dear Tooth Fairy, but since she’s assigned to you (and your teeth- Ha Ha ) I guess it’s for her. This was that yellow letter.. 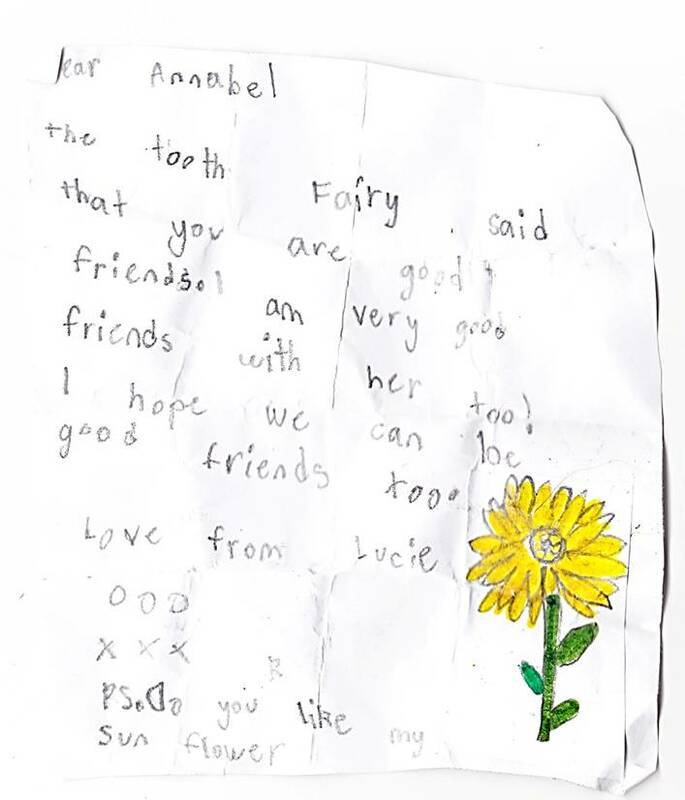 Thank you for your lovely letter, Annabel found and brought to me. Such a pretty picture of you! Thank you so much!!! I laughed at your idea about magic runners, that would be a great idea for those times we get caught in the rain and our wings get wet. You have no idea how that messes up the tooth collection schedule! So Anabel insisted this time, I go to the library and use the typing machines because she says my written notes are all wonky. I didn’t think they were so bad, maybe my lines aren’t very straight, but she’s right- the magic pens are hard to use if you really want neat writing. And anyway it’s been a busy week for us, on account of it being so windy these past weeks! Simply awful tyring to fly in the wind, but especially carrying coins, not to mention paper and magic pens! I lost half my paper to a gust of wind just last week! One night I was so late and it was so windy, I had to hitch a ride on an owl. Owls are really quite sweet and helpful when you ask nicely. And they are very strong flyers. So how long do we fairies live? We don’t measure our years the way you do, but I suppose in human years, it would be maybe 300 or so? So I have to wonder… are those wobbly teeth of yours every coming out?!?! I’ve been waiting ages! I’m so glad you wrote to me anyway if I had to wait for a tooth much longer I would have to fly past and wobble them myself just to hurry things along so I could have a note from you. Well as I said it’s a busy time because of all this crazy weather so I’d better get going. Take care Lucie, and I look forward to your next tooth. These letters are so tiny I have to wear seriously strong glasses. When Alice writes by hand I have to wear those glasses and hold a magnifying glass over the tiny page to read it at all! 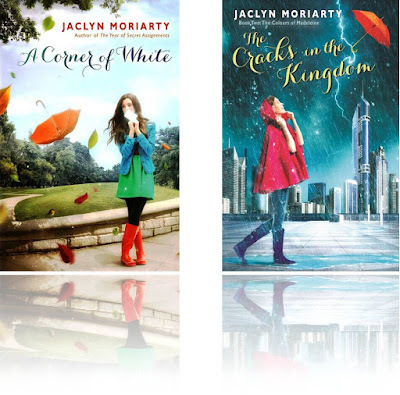 I've been reading this first book, A Corner of White, to Pinkster and coming to the end, she was getting quite stressed to be leaving these wonderful characters and magical beings like the Butterfly Child. But I've assured her I have the second book and now she's a bit more relaxed about it. But I must say sometimes we're reading well past bed time because the story is getting a bit too exciting - Pinkster's own gasps of revelation are often keeping her awake! Better still, a little bird told me that the third and final book will be out early next year. Yay!